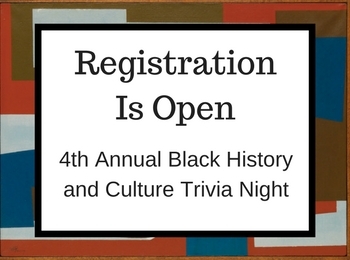 Since 2015, the University of Missouri Libraries and the MU Black History Month Planning Committee have hosted Black History Trivia Night on the last day of the culture-packed month of February. This year, for the first time, the event has co-sponsors that will make it a true “town/gown” event spotlighting local minority-owned businesses. Black History and Culture Trivia Night 2018 will take place at 6:00 p.m. on Wednesday February 28 in the Friends Room at Columbia Public Library. Extra-special prizes for the winning and second place teams are being donated by corporate sponsors Columbia Honda and Parmount Marketing Group. Dr. Cyntha Frisby of the MU School of Journalism and longtime local columnist Bill Clark will share “celebrity emcee” honors. Participation in Trivia Night is free; maximum team size is five players. On the registration form, players are given a choice of local business owners for whom they’d like to play, or if they wish, they may register a team of five and name their own captain. A light supper will be served before the game begins, which will allow for plenty of time for mingling among and across teams, as all participants enjoy a fun and competitive evening full of heroic feats of memory, entertaining multimedia questions, and many chances to acquire new knowledge. Registration is online at library.missouri.edu/trivia by phone at 573-443-3161 (Columbia Public Library), 573-642-7261 (Callaway County Public Library) or 573-657-7378 (Southern Boone County Public Library).